In a large shallow dish, stir together the broth, wine, seasoned salt, oregano, pepper and garlic. Add the shrimp and turn them to coat them well. Cover with plastic wrap. Marinate in the refrigerator for 1 1/2 to 2 hours. Do not marinate longer than 2 hours or the shrimp will become tough. Preheat your grill. Remove the shrimp from the dish, reserving the marinade. Thread the shrimp onto skewers, leaving a small space between each. Brush the shrimp with the reserved marinade. Grill 4 inches from the heat for 2 minutes. 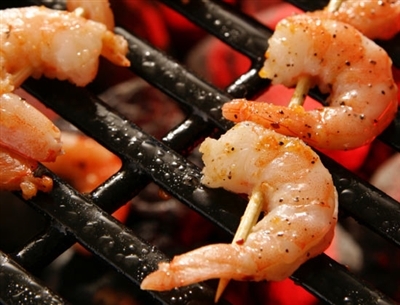 Turn the shrimp over, brush with the marinade and broil for 1-3 minutes more or until the shrimp are no longer pink. Top with chopped parsley, serve with lemon wedges and side dish of your choice.